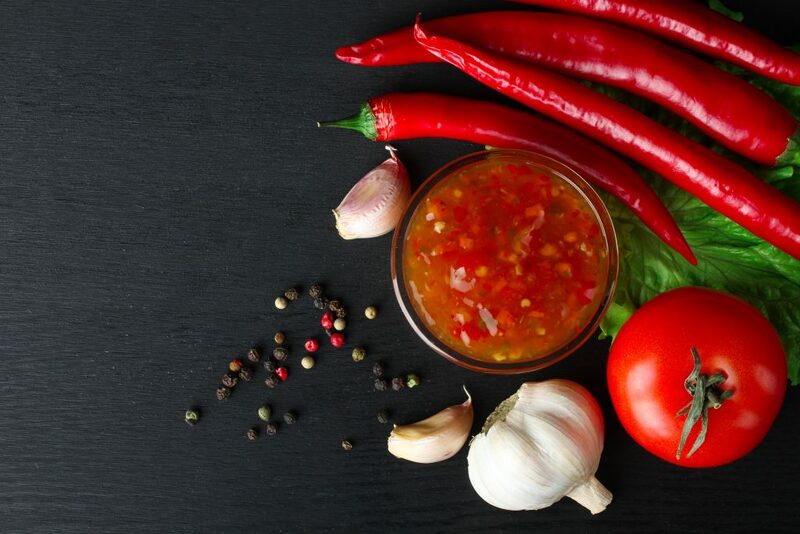 This home-made hot sauce recipe is gluten-free, low-calorie, low-sodium and healthy. Noticeably a pleasantly spicy sauce perfect for seasoning your favorite dishes! This hot sauce recipe requires active preparation of 30 minutes. In addition, the spicy sauce needs to cool to room temperature for about 1 ½ hours. Hence, the total preparation time is 2 hours. In general, the sauce can be stored in the refrigerator for up to one month or frozen in an airtight container for up to 6 months. If you are using super spicy peppers, wear gloves. Indeed, the oils from the pepper can rub off onto your hands. If you accidentally wipe your eyes or scratch your nose, the oils can cause all irritation and a burning sensation. If you were contact lenses, it is advisable to wear your glasses for this one! First, heat the olive oil in a large pan over medium heat. Then add the onion, the peppers, the garlic, and the habaneros (optional) for an extra kick. Then reduce the heat to medium and add the tomatoes, the vinegar, the salt, the honey and the freshly ground peppercorns. Cautiously puree the mixture with an immersion blender, a food processor or a blender. Next, sieve the mixture through a fine mesh sieve, pushing the solids with a wooden spoon to extract the liquid into a medium bowl. Discard the solids that didn’t pass through the fine mesh sieve. Then, set the sauce cool to room temperature, about 1 ½ hours. Finally, transfer the sauce into an airtight container.